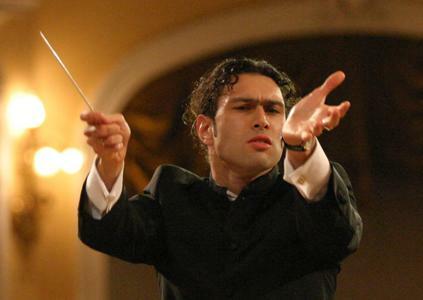 Vladimir Jurowski conducted the Phildalephia Orchestra in a program of Wagner, Beethoven, and Prokofiev. Conductor Vladimir Jurowski was on the short list of maestro candidates for the Philadelphia Orchestra and his guest appearances in the last few years have installed his imprint. You instantly notice his recalibrated strings; there is something about Russian conductors’ deep bowing and string gradations that engulf a hall. Those strings and other Jurowski accents were on dazzling display in a rousing program of Wagner, Beethoven and Prokofiev. Jurowski’s style isn’t physically flashy, keeping most of his movement in the upper body, but the musical passion nonetheless flows starting with the tempered power in Wagner’s “Parsifal,” so airborne in the approach and serene on the surface, and then you are bathed in the sonic power of it. This is symphonic foreshadowing of the thunder yet to come. Beethoven’s Violin Concerto is a marathon of virtuosic playing, but there must be something magical in performance to render the full power of the work and whatever this is, violinist Lisa Batiashvili conjured it. She had palpable synergy with the orchestra throughout and fired those famous devilish cadenzas with authority. She chose Alfred Schnittke famously (and controversially) rewrites. The section almost plays like a classical abstract jazz solo, and on its own terms, musically fascinating. No one knows what Beethoven would have felt about its place in his work, but forgetting that, Batiashvili’s version was breathtaking. Prokofiev’s Symphony No. 6 was written in 1945, reflecting a period of illness and artistic stress, but also musical experimentation after his triumphantly received fifth symphony. The composer had been working under Soviet artistic sanctions of his work, but his nationalistic film scores to “Alexander Nevsky,” “Ivan the Terrible” are bursting with freethinking subtext that survived unflagged. And the sixth has similar sub-streams, brought forth passionately by Jurowski. He builds Prokofiev’s epochal architecture by not missing one subtlety. There is such a heart-pounding interplay between the strings, horns and percussion in the work. Jennifer Montone’s French horn so stoically heralded as the rest of the horns came through a storm. The shattering crescendo in the vivace, compared to the composer’s ballet score of “Romeo and Juliet,” is an orchestral A-bomb, Jurowski letting loose Prokofiev’s concussive primal scream. Three days later in the same hall, Valery Gergiev conducted The London Symphony Orchestra in Mahler’s complex and tricky Symphony No. 7. The work’s morphing architecture demands interpretive skill and unpaused narrative drive, which as a veteran ballet conductor, Gergiev is more than equipped to deliver. The orchestra seemed not to get past an academic surface in the first movement. After a few crystallized lines from lead violinist Roman Simovic, however, it seemed to be released from under glass. Gergiev’s hair-trigger tempo shifts and orchestral moods were frequently dazzling. Mahler’s sudden musical swings into orchestral tangos and burnished waltzes draw you deeper into the squirrelly structure. Also very potent are the sudden mise-en-scène effects from ancient cymbals, bass pizzicato and beguiling mandolin that appear and vanish. The full orchestral fireworks are landed by Gergiev at full power, if not quite three dimensions in this hall. But the allegro sections in the finale unleashed LSO’s most fiery orchestral diamonds. Whatever slights along the way in this mighty work were forgotten by the Mahler fans in the audience who pounded their approval through five curtain calls for Gergiev.